Citation Information: J Clin Invest. 1999;103(7):925-929. https://doi.org/10.1172/JCI6562. Citation Information: J Clin Invest. 1999;103(7):931-943. https://doi.org/10.1172/JCI6609. Citation Information: J Clin Invest. 1999;103(7):945-952. https://doi.org/10.1172/JCI4106. Immune mechanisms and the renin–angiotensin system are implicated in preeclampsia. We investigated 25 preeclamptic patients and compared them with 12 normotensive pregnant women and 10 pregnant patients with essential hypertension. Antibodies were detected by the chronotropic responses to AT1 receptor–mediated stimulation of cultured neonatal rat cardiomyocytes coupled with receptor-specific antagonists. Immunoglobulin from all preeclamptic patients stimulated the AT1 receptor, whereas immunoglobulin from controls had no effect. The increased autoimmune activity decreased after delivery. Affinity-column purification and anti–human IgG and IgM antibody exposure implicated an IgG antibody directed at the AT1 receptor. Peptides corresponding to sites on the AT1 receptor's second extracellular loop abolished the stimulatory effect. Western blotting with purified patient IgG and a commercially obtained AT1 receptor antibody produced bands of identical molecular weight. Furthermore, confocal microscopy of vascular smooth muscle cells showed colocalization of purified patient IgG and AT1 receptor antibody. The protein kinase C (PKC) inhibitor calphostin C prevented the stimulatory effect. Our results suggest that preeclamptic patients develop stimulatory autoantibodies against the second extracellular AT1 receptor loop. The effect appears to be PKC-mediated. These novel autoantibodies may participate in the angiotensin II–induced vascular lesions in these patients. Citation Information: J Clin Invest. 1999;103(7):953-961. https://doi.org/10.1172/JCI5505. We have previously shown that in rat renal cortex, cyclooxygenase-2 (COX-2) expression is localized to cTALH cells in the region of the macula densa, and that dietary salt restriction increases COX-2 expression. Administration of the angiotensin converting inhibitor, captopril, further increased COX-2 mRNA and renal cortical COX-2 immunoreactivity, with the most pronounced expression in the macula densa. Administration of an AT1 receptor antagonist, losartan, also significantly increased cortical COX-2 mRNA expression and COX-2 immunoreactivity. Mutant mice homozygous for both Agtr1a and Agtr1b null mutations (Agtr1a–/–,Agtr1b–/–) demonstrated large increases in immunoreactive COX-2 expression inthe cTALH/macula densa. To determine whether increased COX-2expression in response to ACE inhibition mediated increases in renin production, rats were treated with captopril for one week with or without the specific COX-2 inhibitor, SC58236. Plasma renin activity increased significantly in the captropril group, and this increase was significantly inhibited by simultaneous treatment with SC58236. Thus, these studies indicated that angiotensin II inhibitors augment upregulation of renal cortical COX-2 in states of volume depletion, suggesting that negative feedback by the renin-angiotensin system modulates renal cortical COX-2 expression and that COX-2 is a mediator of increased renin production in response to inhibition of angiotension II production. Citation Information: J Clin Invest. 1999;103(7):963-970. https://doi.org/10.1172/JCI5206. We have investigated the expression of heme oxygenase (HO) in the rat kidney and the effects of HO-dependent heme metabolites on the apical 70-pS K+ channel in the thick ascending limb (TAL). Reverse transcriptase–PCR (RT-PCR) and Western blot analyses indicate expression of the constitutive HO form, HO-2, in the rat cortex and outer medulla. Patch-clamping showed that application of 10 μM chromium mesoporphyrin (CrMP), an inhibitor of HO, reversibly reduced the activity of the apical 70-pS K+ channel, defined by NPo, to 26% of the control value. In contrast, addition of 10 μM magnesium protoporphyrin had no significant effect on channel activity. HO involvement in regulation of the apical 70-pS K+ channel of the TAL, was further indicated by the addition of 10 μM heme-L-lysinate, which significantly stimulated the channel activity in cell-attached patches by 98%. The stimulatory effect of heme on channel activity was also observed in inside-out patches in the presence of 0.5–1 mM reduced nicotinamide adenine dinucleotide phosphate. This was completely abolished by 10 μM CrMP, suggesting that a HO-dependent metabolite of heme mediated the effect. This was further supported by exposure of the cytosolic membrane of inside-out patches to a carbon monoxide–bubbled bath solution, which increased channel activity. Moreover, carbon monoxide completely abolished the effect of 10 μM CrMP on the channel activity. In contrast, 10 μM biliverdin, another HO-dependent metabolite of heme, had no effect. We conclude that carbon monoxide produced from heme via an HO-dependent metabolic pathway stimulates the apical 70-pS K+ channel in the rat TAL. Citation Information: J Clin Invest. 1999;103(7):971-978. https://doi.org/10.1172/JCI5457. To evaluate the role of ceramide (Cer) in apoptosis signaling, we examined Cer formation induced by CD95, etoposide, or γ-radiation (IR) in relation to caspase activation and mitochondrial changes in Jurkat T cells. The Cer response to all three stimuli was mapped in between caspases sensitive to benzoyloxycarbonyl-VAD-fluoromethylketone (zVAD-fmk) and acetyl-DEVD-aldehyde (DEVD-CHO). Cer production was independent of nuclear fragmentation but associated with the occurrence of other aspects of the apoptotic morphology. Caspase-8 inhibition abrogated Cer formation and apoptosis induced by CD95 but did not affect the response to etoposide or IR, placing CD95-induced Cer formation downstream from caspase-8 and excluding a role for caspase-8 in the DNA damage pathways. CD95 signaling to the mitochondria required caspase-8, whereas cytochrome c release in response to DNA damage was caspase-independent. These results indicate that the caspases required for the Cer response to etoposide and IR reside at or downstream from the mitochondria. Bcl-2 overexpression abrogated the Cer response to etoposide and IR and reduced CD95-induced Cer accumulation. We conclude that the Cer response to DNA damage fully depends on mitochondrion-dependent caspases, whereas the response to CD95 partially relies on these caspases. Our data imply that Cer is not instrumental in the activation of inducer caspases or signaling to the mitochondria. Rather, Cer formation is associated with the execution phase of apoptosis. Citation Information: J Clin Invest. 1999;103(7):979-987. https://doi.org/10.1172/JCI6073. Although thyroid hormones are critically important for the coordination of morphogenic processes in the fetus and neonate, premature exposure of the embryo to levels of the hormones present in the adult is detrimental and can result in growth retardation, malformations, and even death. We report here that the pregnant rat uterus expresses extremely high levels of the type 3 iodothyronine deiodinase (D3), which inactivates thyroxine and 3,3′,5-triiodothyronine by 5-deiodination. Both D3 mRNA and activity were present at the implantation site as early as gestational day 9 (E9), when expression was localized using in situ hybridization to uterine mesometrial and antimesometrial decidual tissue. At later stages of gestation, uterine D3 activity remained very high, and the levels exceeded those observed in the placenta and in fetal tissues. After days E12 and E13, as decidual tissues regressed, D3 expression became localized to the epithelial cells lining the recanalized uterine lumen that surrounds the fetal cavity. These findings strongly suggest that the pregnant uterus, in addition to the placenta, plays a critical role in determining the level of exposure of the fetus to maternal thyroid hormones. Citation Information: J Clin Invest. 1999;103(7):989-997. https://doi.org/10.1172/JCI5574. Asthma, a family of airway disorders characterized by airway inflammation, has an increasing incidence worldwide. Platelet-activating factor (PAF) may play a role in the pathophysiology of asthma. Its proinflammatory actions are antagonized by PAF acetylhydrolase. A missense mutation (V279F) in the PAF acetylhydrolase gene results in the complete loss of activity, which occurs in 4% of the Japanese population. We asked if PAF acetylhydrolase deficiency correlates with the incidence and severity of asthma in Japan. We found that the prevalence of PAF acetylhydrolase deficiency is higher in Japanese asthmatics than healthy subjects and that the severity of this syndrome is highest in homozygous-deficient subjects. We conclude that the PAF acetylhydrolase gene is a modulating locus for the severity of asthma. Citation Information: J Clin Invest. 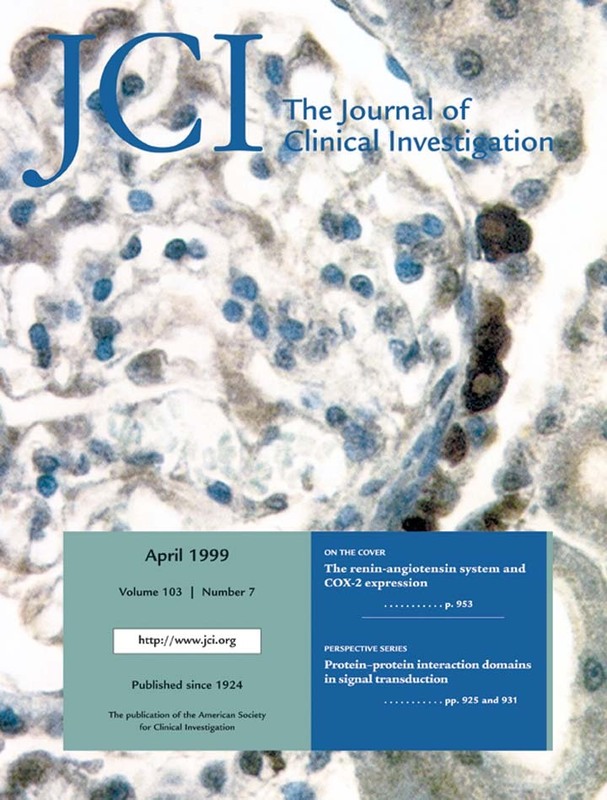 1999;103(7):999-1006. https://doi.org/10.1172/JCI4874. The association between Z α1-antitrypsin deficiency and juvenile cirrhosis is well-recognized, and there is now convincing evidence that the hepatic inclusions are the result of entangled polymers of mutant Z α1-antitrypsin. Four percent of the northern European Caucasian population are heterozygotes for the Z variant, but even more common is S α1-antitrypsin, which is found in up to 28% of southern Europeans. The S variant is known to have an increased susceptibility to polymerization, although this is marginal compared with the more conformationally unstable Z variant. There has been speculation that the two may interact to produce cirrhosis, but this has never been demonstrated experimentally. This hypothesis was raised again by the observation reported here of a mixed heterozygote for Z α1-antitrypsin and another conformationally unstable variant (I α1-antitrypsin; 39Arg→Cys) identified in a 34-year-old man with cirrhosis related to α1-antitrypsin deficiency. The conformational stability of the I variant has been characterized, and we have used fluorescence resonance energy transfer to demonstrate the formation of heteropolymers between S and Z α1-antitrypsin. Taken together, these results indicate that not only may mixed variants form heteropolymers, but that this can causally lead to the development of cirrhosis. Citation Information: J Clin Invest. 1999;103(7):1007-1013. https://doi.org/10.1172/JCI4711. Giant cell arteritis (GCA) is a systemic vasculitis preferentially affecting large and medium-sized arteries. Inflammatory infiltrates in the arterial wall induce luminal occlusion with subsequent ischemia and degradation of the elastic membranes, allowing aneurysm formation. To identify pathways relevant to the disease process, differential display–PCR was used. The enzyme aldose reductase (AR), which is implicated in the regulation of tissue osmolarity, was found to be upregulated in the arteritic lesions. Upregulated AR expression was limited to areas of tissue destruction in inflamed arteries, where it was detected in T cells, macrophages, and smooth muscle cells. The production of AR was highly correlated with the presence of 4-hydroxynonenal (HNE), a toxic aldehyde and downstream product of lipid peroxidation. In vitro exposure of mononuclear cells to HNE was sufficient to induce AR production. The in vivo relationship of AR and HNE was explored by treating human GCA temporal artery–severe combined immunodeficiency (SCID) mouse chimeras with the AR inhibitors Sorbinil and Zopolrestat. Inhibition of AR increased HNE adducts twofold and the number of apoptotic cells in the arterial wall threefold. These data demonstrate that AR has a tissue-protective function by preventing damage from lipid peroxidation. We propose that AR is an oxidative defense mechanism able to neutralize the toxic effects of lipid peroxidation and has a role in limiting the arterial wall injury mediated by reactive oxygen species. Citation Information: J Clin Invest. 1999;103(7):1015-1021. https://doi.org/10.1172/JCI5849. To determine the role of surfactant protein-A(SP-A) in antiviral host defense, mice lacking SP-A (SP-A–/–) were produced by targeted gene inactivation. SP-A–/– and control mice (SP-A+/+) were infected with respiratory syncytial virus (RSV) by intratracheal instillation. Pulmonary infiltration after infection was more severe in SP-A–/– than in SP-A+/+ mice and was associated with increased RSV plaque-forming units in lung homogenates. Pulmonary infiltration with polymorphonuclear leukocytes was greater in the SP-A–/– mice. Levels of proinflammatory cytokines tumor necrosis factor-α and interleukin-6 were enhanced in lungs of SP-A–/– mice. After RSV infection, superoxide and hydrogen peroxide generation was deficient in macrophages from SP-A–/– mice, demonstrating a critical role of SP-A in oxidant production associated with RSV infection. Coadministration of RSV with exogenous SP-A reduced viral titers and inflammatory cells in the lung of SP-A–/– mice. These findings demonstrate that SP-A plays an important host defense role against RSV in vivo. Citation Information: J Clin Invest. 1999;103(7):1023-1029. https://doi.org/10.1172/JCI6224. T-helper 1 (Th1) cells are believed to be the major producer of the type 1 cytokine interferon-γ (IFN-γ) in cell-mediated immunity against intracellular infection. We have investigated the ability of macrophages to release type 1 cytokines and their regulatory mechanisms using both in vivo and in vitro models of pulmonary mycobacterial infection. During pulmonary infection by live Mycobacterium bovis bacilli Calmette-Guérin (BCG) in wild-type mice, lung macrophages released interleukin-12 (IL-12), IFN-γ, and tumor necrosis factor-α (TNF-α), and expressed surface activation markers. However, macrophages in infected IL-12–/– mice released TNF-α but not IFN-γ and lacked surface activation makers. In freshly isolated lung macrophages from naive IL-2–/– mice, mycobacteria alone released TNF-α but not IFN-γ, whereas exogenously added IL-12 alone released a minimum of IFN-γ. However, these macrophages released large quantities of IFN-γ upon stimulation with both mycobacteria and IL-12. In contrast, mycobacteria and exogenous IFN-γ released only a minimum of endogenous IFN-γ. Endogenous IL-18 (IFN-γ–inducing factor) played little role in IFN-γ responses by macrophages stimulated by mycobacteria and IL-12. Our data reveal that macrophages are a significant source of type 1 cytokines during mycobacterial infection and that both IL-12 and intracellular pathogens are required for the release of IFN-γ but not TNF-α. These findings suggest that macrophages regulate cell-mediated immunity by releasing not only IL-12 and TNF-α but also IFN-γ and that full activation of IFN-γ response in macrophages is tightly regulated. Citation Information: J Clin Invest. 1999;103(7):1031-1038. https://doi.org/10.1172/JCI5943. Arthrogryposis multiplex congenita (AMC) is characterized by fixed joint contractures and other deformities, sometimes resulting in fetal death. The cause is unknown in most cases, but some women with fetuses affected by severe AMC have serum antibodies that inhibit fetal acetylcholine receptor (AChR) function, and antibodies to fetal antigens might play a pathogenic role in other congenital disorders. To investigate this possibility, we have established a model by injecting pregnant mice with plasma from four anti-AChR antibody–positive women whose fetuses had severe AMC. We found that human antibodies can be transferred efficiently to the mouse fetus during the last few days of fetal life. Many of the fetuses of dams injected with AMC maternal plasmas or Ig were stillborn and showed fixed joints and other deformities. Moreover, similar changes were found in mice after injection of a serum from one anti-AChR antibody–negative mother who had had four AMC fetuses. Thus, we have confirmed the role of maternal antibodies in cases of AMC associated with maternal anti-AChR, and we have demonstrated the existence of pathogenic maternal factors in one other case. Importantly, this approach can be used to look at the effects of other maternal human antibodies on development of the fetus. Citation Information: J Clin Invest. 1999;103(7):1039-1046. https://doi.org/10.1172/JCI5779. Human leukocyte elastase (HLE), a polymorphonuclear neutrophil (PMN) serine proteinase, is proteolytically active on some membrane receptors at the surface of immune cells. The present study focused on the effect of HLE on the expression of CD14, the main bacterial lipopolysaccharide (LPS) receptor at the surface of monocytes. HLE exhibited a time- and concentration-dependent downregulatory effect on CD14 surface expression. A 30-minute incubation of 3 μM HLE was required to display 95% disappearance of the receptor. This downregulation resulted from a direct proteolytic process, not from a shedding consecutive to monocyte activation as observed upon challenge with phorbol myristate acetate (PMA). To confirm that CD14 is a substrate for HLE, this enzyme was incubated with recombinant human CD14 (Mr ∼ 57,000), and proteolysis was further analyzed by immunoblot analysis. Cleavage of the CD14 molecule was directly evidenced by the generation of short-lived fragments (Mr ∼ 47,000 and 30,000). As a consequence of the CD14 proteolysis, a decrease in the responsiveness of monocytes to LPS was observed, as assessed by measuring tumor necrosis factor-α (TNF-α) formation. This inhibition was only observed with 1 ng/ml of LPS, i.e., when only the CD14-dependent pathway was involved. At a higher LPS concentration, such as 10 μg/ml, when CD14-independent pathways were operative, this inhibition was overcome. The direct proteolysis by HLE of the membrane CD14 expressed on monocytes illustrates a potential anti-inflammatory effect of HLE through inhibition of LPS-mediated cell activation. Citation Information: J Clin Invest. 1999;103(7):1047-1054. https://doi.org/10.1172/JCI5342. Heme oxygenase-1 (HO-1) confers protection against a variety of oxidant-induced cell and tissue injury. In this study, we examined whether exogenous administration of HO-1 by gene transfer could also confer protection. We first demonstrated the feasibility of overexpressing HO-1 in the lung by gene transfer. A fragment of the rat HO-1 cDNA clone containing the entire coding region was cloned into plasmid pAC-CMVpLpA, and recombinant adenoviruses containing the rat HO-1 cDNA fragment Ad5-HO-1 were generated by homologous recombination. Intratracheal administration of Ad5-HO-1 resulted in a time-dependent increase in expression of HO-1 mRNA and protein in the rat lungs. Increased HO-1 protein expression was detected diffusely in the bronchiolar epithelium of rats receiving Ad5-HO-1, as assessed by immunohistochemical studies. We then examined whether ectopic expression of HO-1 could confer protection against hyperoxia-induced lung injury. Rats receiving Ad5-HO-1, but not AdV-βGal, a recombinant adenovirus expressing Escherichia coli β-galactosidase, before exposure to hyperoxia (>99% O2) exhibited marked reduction in lung injury, as assessed by volume of pleural effusion and histological analyses (significant reduction of edema, hemorrhage, and inflammation). In addition, rats receiving Ad5-HO-1 also exhibited increased survivability against hyperoxic stress when compared with rats receiving AdV-βGal. Expression of the antioxidant enzymes manganese superoxide dismutase (Mn-SOD) and copper-zinc superoxide dismutase (CuZn-SOD) and of L-ferritin and H-ferritin was not affected by Ad5-HO-1 administration. Furthermore, rats treated with Ad5-HO-1 exhibited attenuation of hyperoxia-induced neutrophil inflammation and apoptosis. Taken together, these data suggest the feasibility of high-level HO-1 expression in the rat lung by gene delivery. To our knowledge, we have demonstrated for the first time that HO-1 can provide protection against hyperoxia-induced lung injury in vivo by modulation of neutrophil inflammation and lung apoptosis. Citation Information: J Clin Invest. 1999;103(7):1055-1066. https://doi.org/10.1172/JCI3816. Extracellular superoxide dismutase (EC-SOD, or SOD3) is the major extracellular antioxidant enzyme in the lung. To study the biologic role of EC-SOD in hyperoxic-induced pulmonary disease, we created transgenic (Tg) mice that specifically target overexpression of human EC-SOD (hEC-SOD) to alveolar type II and nonciliated bronchial epithelial cells. Mice heterozygous for the hEC-SOD transgene showed threefold higher EC-SOD levels in the lung compared with wild-type (Wt) littermate controls. A significant amount of hEC-SOD was present in the epithelial lining fluid layer. Both Tg and Wt mice were exposed to normobaric hyperoxia (>99% oxygen) for 48, 72, and 84 hours. Mice overexpressing hEC-SOD in the airways attenuated the hyperoxic lung injury response, showed decreased morphologic evidence of lung damage, had reduced numbers of recruited inflammatory cells, and had a reduced lung wet/dry ratio. To evaluate whether reduced numbers of neutrophil infiltration were directly responsible for the tolerance to oxygen toxicity observed in the Tg mice, we made Wt and Tg mice neutropenic using anti-neutrophil antibodies and subsequently exposed them to 72 hours of hyperoxia. Both Wt and Tg neutrophil-depleted (ND) mice have less severe lung injury compared with non-ND animals, thus providing direct evidence that neutrophils recruited to the lung during hyperoxia play a distinct role in the resultant acute lung injury. We conclude that oxidative and inflammatory processes in the extracellular lung compartment contribute to hyperoxic-induced lung damage and that overexpression of hEC-SOD mediates a protective response to hyperoxia, at least in part, by attenuating the neutrophil inflammatory response. Citation Information: J Clin Invest. 1999;103(7):1067-1076. https://doi.org/10.1172/JCI6246. Transgenic mice that overexpress the nuclear form of sterol regulatory element binding protein-1a (SREBP-1a) in liver (TgBP-1a mice) were shown previously to overproduce cholesterol and fatty acids and to accumulate massive amounts of cholesterol and triglycerides in hepatocytes. Despite the hepatic overproduction of lipids, the plasma levels of cholesterol (∼45 mg/dl) and triglycerides (∼55 mg/dl) were not elevated, perhaps owing to degradation of lipid-enriched particles by low-density lipoprotein (LDL) receptors. To test this hypothesis, in the current studies we bred TgBP-1a mice with LDL receptor knockout mice. As reported previously, LDLR–/– mice manifested a moderate elevation in plasma cholesterol (∼215 mg/dl) and triglycerides (∼155 mg/dl). In contrast, the doubly mutant TgBP-1a;LDLR–/– mice exhibited marked increases in plasma cholesterol (∼1,050 mg/dl) and triglycerides (∼900 mg/dl). These lipids were contained predominantly within large very-low-density lipoprotein (VLDL) particles that were relatively enriched in cholesterol and apolipoprotein E. Freshly isolated hepatocytes from TgBP-1a and TgBP-1a;LDLR–/– mice overproduced cholesterol and fatty acids and secreted increased amounts of these lipids into the medium. Electron micrographs of livers from TgBP-1a mice showed large amounts of enlarged lipoproteins within the secretory pathway. We conclude that the TgBP-1a mice produce large lipid-rich lipoproteins, but these particles do not accumulate in plasma because they are degraded through the action of LDL receptors. Citation Information: J Clin Invest. 1999;103(7):1077-1087. https://doi.org/10.1172/JCI5809. CD4+ T helper (TH)1- and TH2-type cytokines reportedly play an important role in the pathobiology of asthma. Recent evidence suggests that proasthmatic changes in airway smooth muscle (ASM) responsiveness may be induced by the autocrine release of certain proinflammatory cytokines by the ASM itself. We examined whether TH1- and TH2-type cytokines are expressed by atopic asthmatic sensitized ASM and serve to autologously regulate the proasthmatic phenotype in the sensitized ASM. Expression of these cytokines and their receptors was examined in isolated rabbit and human ASM tissues and cultured cells passively sensitized with sera from atopic asthmatic patients or control subjects. Relative to controls, atopic sensitized ASM cells exhibited an early increased mRNA expression of the TH2-type cytokines, interleukin-5 (IL-5) and granulocyte–macrophage colony-stimulating factor (GM-CSF), and their receptors. This was later followed by enhanced mRNA expression of the TH1-type cytokines, IL-2, IL-12, and interferon-γ (IFN-γ), as well as their respective receptors. In experiments on isolated ASM tissue segments (a) exogenous administration of IL-2 and IFN-γ to atopic asthmatic serum–sensitized ASM ablated both their enhanced constrictor responsiveness to acetylcholine (ACh) and their attenuated relaxation responsiveness to β-adrenoceptor stimulation with isoproterenol, and (b) administration of IL-5 and GM-CSF to naive ASM induced significant increases in their contractility to ACh and impaired their relaxant responsiveness to isoproterenol. Collectively, these observations provide new evidence demonstrating that human ASM endogenously expresses both TH1- and TH2-type cytokines and their receptors, that these molecules are sequentially upregulated in the atopic asthmatic sensitized state, and that they act to downregulate and upregulate proasthmatic perturbations in ASM responsiveness, respectively. Citation Information: J Clin Invest. 1999;103(7):1089-1097. https://doi.org/10.1172/JCI4848. We investigated the mechanisms responsible for altered contractile and relaxation function in overexpressed Gsα myocytes. Although baseline contractile function (percent contraction) in Gsα mice was similar to that of wild-type (WT) mice, left ventricular myocyte contraction, fura-2 Ca2+transients, and Ca2+ channel currents (ICa) were greater in Gsα mice in response to 10–8 M isoproterenol (ISO) compared with WT mice. The late phase of relaxation of the isolated myocytes and fura-2 Ca2+ transients was accelerated at baseline in Gsα but did not increase further with ISO. In vivo measurements using echocardiography also demonstrated enhanced relaxation at baseline in Gsα mice. Forskolin and CaCl2 increased contraction similarly in WT and Gsα mice. Rp-cAMP, an inhibitor of protein kinase, blocked the increases in contractile response and Ca2+ currents to ISO in WT and to forskolin in both WT and Gsα. It also blocked the accelerated relaxation in Gsα at baseline but not the contractile response to ISO in Gsα myocytes. Baseline measurements of cAMP and phospholambation phosphorylation were enhanced in Gsα compared with WT. These data indicate that overexpression of Gsα accelerates relaxation at end diastolic but does not affect baseline systolic function in isolated myocytes. However, the enhanced responses to sympathetic stimulation partly reflect increased Ca2+ channel activity; i.e the cellular mechanisms mediating these effects appear to involve a cAMP-independent as well as a cAMP-dependent pathway. Citation Information: J Clin Invest. 1999;103(7):1099-1099. https://doi.org/10.1172/JCI5121C1.